Learn more about the different settings you can apply to your Easy Content display. The content that is displayed on your site depends on a few settings. 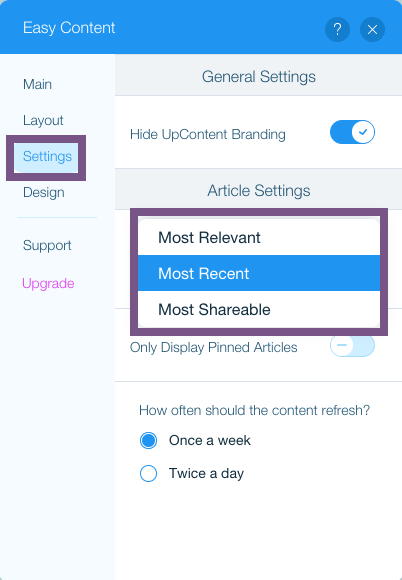 If you have upgraded your plan and "pinned" certain content, those articles will stay indefinitely. The rest of the content that is displayed will depend on the sorting filter you have applied to your content. Most Recent: Articles will be displayed by most recently published. Most Relevant: Based on your search criteria and our own scoring algorithm, the articles that are most applicable to your category. Most Shareable: Displays content in order of how likely your audience is to engage with the article. This is based on the article's use of power words and phrases within its title and body. This setting pertains to how often we will re-do the search to look for new content. As more searches require more system resources from us, the "Twice a day" refresh feature is for upgraded plans only.